Sorry, Mr. Colbert, I am guilty of dressing up my language all the time. I use metaphors and analogies to increase meaning in my writings and speech to have people understand something from the point of view of something they do know. I realize that some metaphors are a dime a dozen, but we use and see them far more than we think. In the blog for my grad school writing course, my professor wrote about metaphors. He said of the subject, “When we share the new with the old. When we look into the unknown with the familiar.” The word look was a standout for me. In design, I try to build a connection between the project and the audience. Sometimes that connection is obvious, while others can be unexpected. Until recently, I never really thought of designs and the term metaphor together. Mario Pricken’s book, Creating Advertising: Ideas and Technique’s From The World’s Best Campaigns, he talks about the basic principle of metaphor and analogy in advertising. He describes visual metaphors as taking two elements from different spheres (like nature or technology) and compare the similarities, be it function of physical characteristic. The book cites the Volvo ad below as an example. 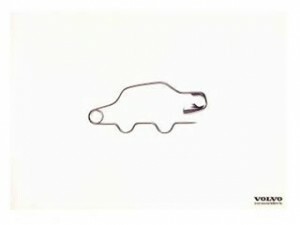 Volvo cars have that unique shape that many people are familiar with and comparing that to a paperclip shaped like it is unexpected (to me). It is simple, yet effective (although I can’t help but think what other messages they are trying to tell us, is it a lightweight car?) Another example that stood out was from Dunkin Donuts. With the exception of an old, decrepit location around the corner from my apartment, Dunkin Donuts has gone through a slight rebranding. 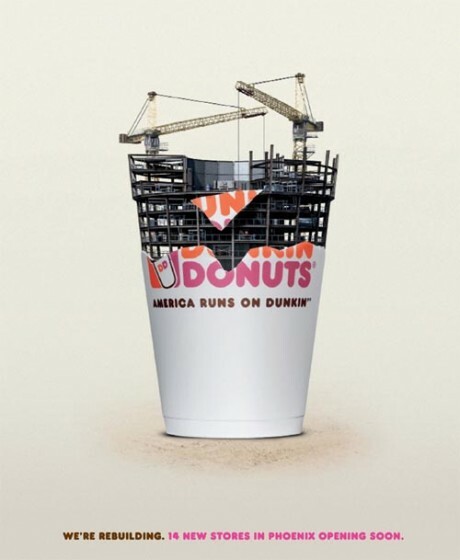 From the slogan, “America Runs On Dunkin,” which has a visual metaphor right in the graphic to the actual locations, the famous franchise has been remodeled. The above ad sums that up. Somewhat unknowingly, the metaphorical approach was something I was going for in an ad I created for the United Way of Greater New Haven. The event was a diaper drive for their annual Days of Caring volunteer event. I chose three different babies in diapers, with the subhead, ensuring babies are dressed for success. While that message was clear, what I was really going for was United Way’s mission of education, income and health. The baby on the far left with the block represents education, the baby in the briefcase and tie represents income and the baby with the stethoscope represents health. My attempt was to use a metaphor for not only the event, but the bigger picture for United Way’s general mission. They appreciated that as it spoke to a general and specific audience. Pricken, Mario. “Chapter 2.29.” Creative Advertising: Ideas and Techniques from the World’s Best Campaigns. New York: Thames & Hudson, 2002.